I was given 2 blanks by Constant with Lazerlinez several months ago so I could provide a review of the stabilizing process Constant offers. Constant, I apologize for being so delinquent in doing this, but the late review brings your service to light again. When I received the package, I was pleasantly surprised by the relatively pleasant aroma of the stabilizing material. I've had hundreds of blanks professionally stabilized over the years with the smell being somewhat overwhelming for several weeks after the blanks were returned. It was nice to see that Constant's process was that much different. I recently turned the blanks to see how the stabilization process held up over time. The blanks turned extremely well, producing a fine powder as the blank was turned. The blanks took a very nice CA finish and polished well. I did not see any noticeable pin holes or other problems with the depth of stabilization. The stabilization fluid appears to have fully penetrated both pieces. As I said earlier, I have had hundreds of blanks stabilized in years past. I will definitely consider Constant when I need more blanks stabilized. Rick, I see two excellent pens posted. My fav is the buckeye burl. That would have been one mean blank to turn had it not been stabilized, I bet. It is beautiful in finish and the fit is right on. The maple is one very nice pen also, but, next to the Buckeye, well, even if it is red, that Buckeye is outstanding. Sorry. I've never turned a stabilized blank before. I have made a handle from a stabilized blank. I'm just wondering, you mention using a CA finish. Is that really necessary on a stabilized blank? I would have thought that the stabilizing process would make a finish unnecessary and the "agent" would've polished up without a finish? I'm just wondering, you mention using a CA finish. Is that really necessary on a stabilized blank? I would have thought that the stabilizing process would make a finish unnecessary and the "agent" would've polished up without a finish? Pen on the left is polished to 12000 and finished with friction polish. Pen on the right is 6 coats of CA. 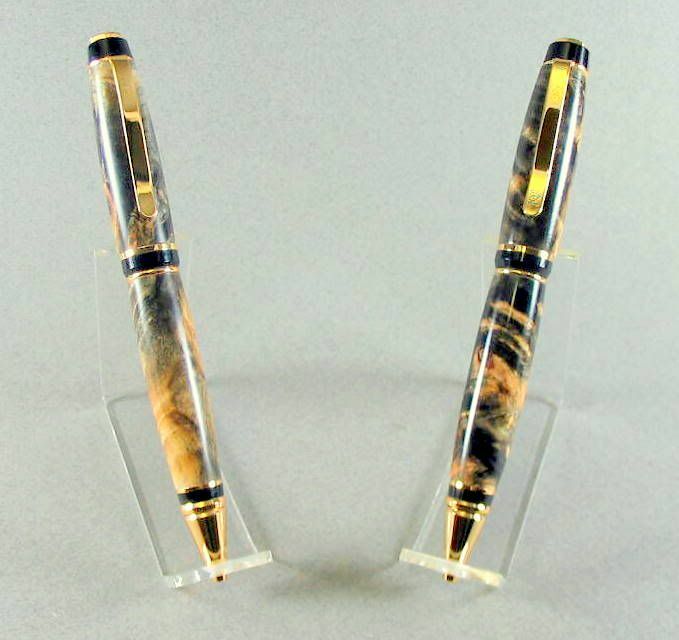 Both are buckeye burl. You decide.